This book follows postwar Germany's leading philosopher and social thinker, Jurgen Habermas, through four decades of political and constitutional struggle over the shape of liberal democracy in Germany. Habermas's most influential theories - of the public sphere, communicative action, and modernity - were decisively shaped by major West German political events: the failure to de-Nazify the judicia… ry, the rise of a powerful Constitutional Court, student rebellions in the late 1960s, the changing fortunes of the Social Democratic Party, NATO's decision to station nuclear weapons, and the unexpected collapse of East Germany. In turn, Habermas's writings on state, law, and constitution played a critical role in reorienting German political thought and culture to a progressive liberal-democratic model. 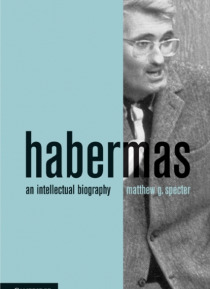 Matthew Specter uniquely illuminates the interrelationship between the thinker and his culture.